The state of South Dakota has many wonders, both natural and artificial -- the most well-known is the sculpture of 4 presidential faces on Mount Rushmore National Memorial. 17 miles away, another monumental work is in progress: The Crazy Horse Memorial emerges more clearly from the mountain with each passing year. When it is finished, it will be the biggest sculpture in the world. Both are located in the Black Hills, Badlands & Lakes Region of South Dakota, a region considered sacred by the Native Americans who were driven out of it in the mid-19th century, when gold was discovered there. While many of the gold mines have been depleted, the Black Hills' mysterious beauty remains, and several hundred thousand acres have been set aside by the national and state park services. Jewel Cave National Monument, named for an abundance of huge calcite crystals, preserves the third longest known cave system in the world. Wind Cave National Park features not only some rare and beautiful cave formations known as "boxwork", but a grass prarie that hosts wildlife including bison, elk, mule deer and prairie dogs. In an ironic twist, another park where the bison roam is Custer State Park, named after George A. Custer, Indian-fighter and buffalo hunter. East of the Black Hills lie the strange, erosion-carved landscapes of Badlands National Park. 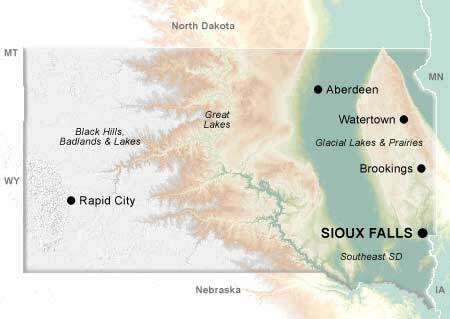 The largest city in South Dakota is Sioux Falls, the state's commercial nerve center. The second largest is Rapid City (named after Rapid Creek, not the tempo of life), which serves as the gateway to the Black Hills and the Badlands. Deadwood, the hometown of Calamity Jane and the scene of Wild Bill Hickok's violent demise, has become a popular destination for gamblers since casinos were reintroduced in 1989.